Mechanical Contractor, Electrical Contractor, HVAC, Plumbing, Process Piping, Welder, Electrician in Tyler TX, Longview TX, and the Greater East Texas area. Robertson Mechanical Contractors, established in 1983 by Bobby Robertson, provides mechanical piping and electrical services to a variety of customers in the Greater East Texas area. Over the years, RMC has built a reputation as an honest mechanical contractor who provides top quality services to their customers. The solid reputation and integrity of Robertson Mechanical Contractors allows this company to continue to grow and become a leading mechanical contractor in the greater East Texas area. We take pride in the quality of our work while ensuring it is completed in a timely manner. The majority of our work is performed in manufacturing plants, so we recognize the importance of completing all work with the least amount of interruptions to production. RMC provides professional mechanical and electrical services with integrity and dependability to get the job done, no matter how big or small the project may be. Robertson Mechanical Contractors provides new installations and renovations for a wide range of industrial, commercial, and HVAC piping systems. RMC is a licensed plumbing and HVAC/R contractor by the State of Texas with experienced craftsman who perform work on all types of piping. Robertson Mechanical Contractors expanded into the electrical trade to become a more diversified company as well as to provide an economical alternative to our customers on construction projects with mechanical and electrical scopes of work. 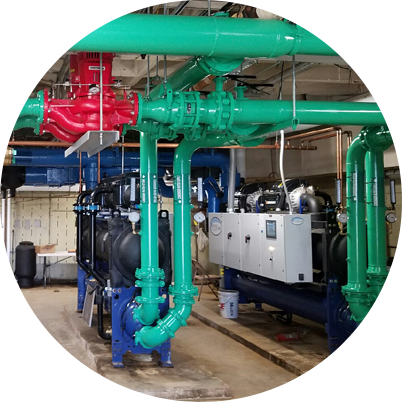 Project included all mechanical and electrical work associated with the replacement of (2) chillers, (2) HW boilers, (8) pumps and miscellaneous piping and control valves throughout the school campus. "I am well pleased with all the work Robertson Mechanical Contractors has done for White Oak ISD." "Working with Robertson Mechanical on projects has been a very good experience." "Their work was completed in a timely manner and the professional quality of work was superior." "Matt and Robertson Mechanical is a partner we look forward to working with again." "They always find a way to get it done and done right. I appreciate their commitment to safety, quality, and professionalism." © 2019 Robertson Mechanical Contractors, L.P.